so here we are again, dropped into the intriguing world of Jace and Clary. I’m trying here – really i am to follow what’s going on – and as much as i’m not LOVING the series, i still find myself drawn to it. We have our same usual suspects in this story with some interesting turns of events coming out. Folks that we really liked are no longer players, others come to the forefront. We’re still trying to figure out what’s going on between Jace and Clary if there is anything (or can be anything). 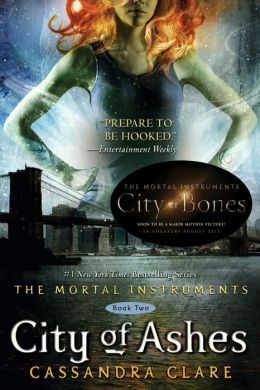 In City of Ashes – we get to know Valentine a little bit better. we know that he’s really really dark – and he’s trying to use the Soul-Sword to turn things around so that the sword has a demonic tone vs. the angelic one that it has now. He’s just evil…plain and simple. I don’t know about anyone else though, but i kind of wonder if Valentine isn’t who he says he is….just a thought that i’m having given that everyone else seems to be someone else as well. Simon continues to play a large role – becoming less than human himself and some how managing to hang on even though his blood is deemed to be necessary by Valentine as well. It’s interesting here though in his relationship with Clary. We usually encounter the best girl/guy friend thing that doesn’t turn into romance, yet in this story, their relationship kind of takes that turn. I have my own opinions – your thoughts? so craziness ensues – people fight/get killed. we’re introduced FINALLY to Robert and Maryse Lightwood which is nice since i always kind of wondered what was going on there and if we’d actually like the parents. We meet Imogen the Inquisitor – and then maybe un-meet her? 1) Anyone else get the feeling that Jace isn’t ‘Jonathan’ – but instead Imogen’s son? i don’t recall that they ever found the body of her son, and she did ask him about a scar that he got on his shoulder. I wonder what she said to him on Valentine’s boat too. Will Jace remember that? 2) Will Alec and Magnus ever actually get together? i actually really really like them as a couple. they are cute…and seem like they are well suited. 4) will jocelyn wake up and who will have a role in helping with that if it does? if she does wake up, will she help fight Valentine, will she end up with Luke? good news here is that i’ve already picked up City of Glass and i started it last night, so hopefully in the next day or so i’ll have some of my questions answered and then i’ll be forced to begin reading City of Angels which i think is the next one after that. This entry was posted in fantasy and tagged Angels, Cassandra Clare, City of Angels, City of Ashes, City of Bones, City of Glass, Jace and Clary, Lightwoods, Magnus Bane, Mortan Instruments, Nephalim, Soul-Sword, Valentine, Vampires, Werewolves, YA lit by iscm13. Bookmark the permalink.